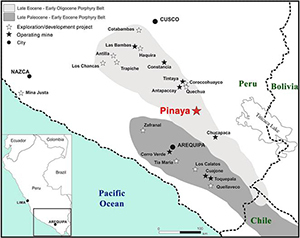 The Pinaya Project covers 192 square kilometres and includes more than 25 kilometres of strike length within the Andahuaylas-Yauri Porphyry Belt in southeastern Peru. This belt hosts numerous productive and world-class porphyry and skarn systems, including Las Bambas, Tintaya, Constancia, Haquira, and Antapaccay. Previous exploration on the property was focused mainly on defining the current Mineral Resources and much less on systematic regional exploration. Kaizen has reviewed existing geochemical and geophysical surveys and has identified multiple untested targets along and across the strike of the current mineral resources. Kaizen has signed land access agreements with the community of Pinaya and individual private landholders that provide Kaizen with access rights to conduct its planned exploration program at the Pinaya Project for a two-year period. Kaizen also signed two separate agreements with the community outlining social development and employment commitments. On February 14, 2017, Kaizen received approval of its Declaration for Environmental Impact ("DIA") for the Pinaya Project. The DIA allows Kaizen to use up to 20 drilling platforms and to drill as many as 55 holes totaling up to 17,200 metres. The DIA also enables Kaizen to excavate 95 trenches. In addition, the Certificate of Non-Existence of Archaeological Remains has been received which is also a precondition to commencing drilling. Kaizen is awaiting the completion of a Consulta Previa, the final government review process before receipt of authorization to commence activities. Upon receipt of the authorization to commence activities, a drilling program of approximately 4,000 metres is planned. Approximately 3,000 metres of drilling will be focused on the expansion of the Pinaya Mineral Resource area, where recent re-logging of core drilled by previous operators has identified compelling resource expansion opportunities along strike to the north and south of the defined Mineral Resource area and in the Antaña target area. An updated National Instrument 43-101 ("NI 43-101") technical report for the Pinaya Project was prepared jointly by Brian Cole, P.Geo and GeoSim Services Inc., with an effective date of April 26, 2016.